My husband is a huge NBA fan and of course we have been watching the final series of the Miami Heat verses the San Antonio Spurs. I played bball in high school myself so I usually watch the games with him. On Thursday we were watching the game and I mentioned how strange it is that now a days they actually film/broadcast what the coaches say to the players in the huddles. Darren said, "well, all he ever says is "keep pounding the rock." 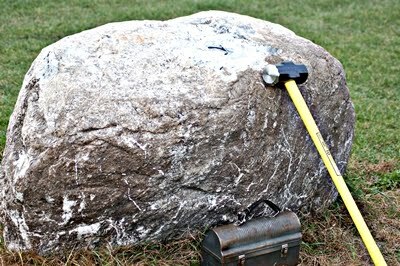 Darren: "In theory if you keep pounding a rock, it will break. The Spurs are steady and strong but older. Their motto this year has been "keep pounding the rock." It all the sudden totally applied to infertility to me (surprise surprise I could connect something to infertility since I'm never, wink wink, thinking about it). Pounding (in my case punching) a rock sounds really really painful. I imagine a really sore hand. Blood. Lots of pain. Frustration. But, with the inspiration of the San Antonio Spurs, they believe if you KEEP pounding the rock it will eventually break. In the world of IF, I have beat the living $%#^#&## out of the rock. I am tired. I am bloody. I am frustrated. But what if all I need is just a few more hits before it breaks? What if I "give up" from all the pain and lack of movement when really one more strong punch would have done the trick? Our IVF #3 is going to happen in July. I have been pounding the rock for over two years. Little weak hits of off-timed IUIs, some bigger hits with perfectly timed IUIs or even on our own, and my hands hurt bad. IVF #3 is going to be an extra hard punch. It will hurt (literally) but I pray that this will be the last swing I have to throw for a bit. Great analogy. That is the perpetual problem. We can never tell if we're one, a few, or 100 more swings away from conquering our ROCK.